We are progressively adding parts stock to our store as it becomes available. Well done Geoff'sXS, I have bought a few items off your site and must say you guys have delivered every time. Keep up the great service. exchange my miss order as well. Thanks again and know that your work is not going unnoticed. Last order was on a Sunday night .... had it on my doorstep Tuesday ....doesn't get any better than that. I received my valve cover gaskets today and wrapped with the quality and service. I have a total of 8 XS bikes, 5 sidecars and 3 solos which I race in classic MX, Speedway and road racing, and have always used Mikes XS. I will always use you from now on where possible because of the service and quality. Thanks so much once again. 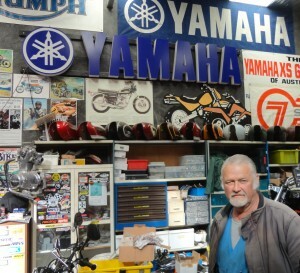 Geoff’sXS has a large array of Used Parts and new aftermarket parts in stock. Contact Geoff if you are looking for second-hand parts. At Geoff’sXS we can satisfy your painting needs, be it an original paint restoration or painted with your preferred/custom colour. Contact Geoff if you are looking a painting quote.